Writers work in all sorts of odd places. This is entirely unlike the chair in my dentist’s office. I prefer this one. The actual putting of pen to paper or finger to keyboard happens in obvious places like homes, offices, libraries, airplanes, and coffee shops, but also in cars, waiting rooms, and grocery store queues, on park benches, beside pools, on outdoor trails, and beside campfires. In addition, the part of writing that involves cogitating, planning, incubating, dreaming, and inventing can happen anywhere and often does. Writers are encouraged to keep notebooks, or at least paper and pencil, nearby at all times to capture the thinking that happens in odd times and places. Many writers, and I know this well because I fall prey to it too often, believe the planning needs to happen before the writing. Often, they go better hand in hand; many writers sort out their ideas through writing – it is because they need to write in order to understand that many became writers in the first place. But, wherever it happens, the key to the incubating phase of writing is letting the subconscious work and simply keeping the conscious mind around to capture the thoughts. As an example, this morning I had a routine dental appointment. My conscious mind needed nothing more than to keep my mouth open the right amount for the dentist to do his work. As I lay back in the chair, looking through the yellow plastic glasses I had been given to protect my eyes from the light shining into my mouth, feeling the dentist scraping and poking around, my mind wandered to the revision needs of The Red Oak. I am composing a response to being tagged in a blog chain, The Next Big Thing, which involves a series of questions about an author’s current work in progress, and the answers to those questions collided with a conversation I had last weekend with M-E Girard and Tobin Elliott during the Writers’ Community of Durham Region Training for Writing Circle Facilitators (which is being led by the amazing team of Ruth Walker and Sue Reynolds and I highly recommend future offerings of it for folks in the Toronto/Durham region who want to lead writing circles). M-E, Tobin, and I were talking about the way YA fantasies featuring a protagonist discovering that s/he is a paranormal being act as a metaphor for coming to terms with any number of ways that a teenager can be atypical. Sitting in the dentist’s chair, my visual world bathed in yellow light, my brain hopped along a series of mental stepping stones: metaphor, source of inspiration for the novel, one sentence synopsis, coming out as atypical. When my thoughts landed on the far shore, I realized I had new possibilities for three major elements of the novel that have been blocking me on this revision. I need to write into them to see how they really fit, but for the first time in ages, I have a direction to go with these three issues. 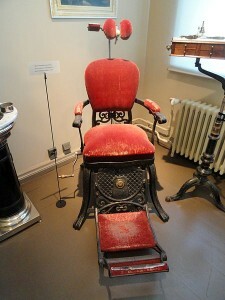 So, there you have it – Writing in The Dentist’s Chair. If you open your mind to your creative impulses, you can’t predict when or where they’ll show up. This entry was posted in Creativity, Daily Life, Writing and tagged dentist chair, M-E Girard, Ruth E. Walker, Sue Reynolds, The Next BIg Thing, Tobin Elliott. That was a great spirited convo we had. I try to explain what the new Books & Bevvies format is like and I can’t articulate it. It’s just that–talking stories, writing, book, all of it. I look 4ward to reading your The Next Big Thing blog. Myself, I totally bailed out before starting. Blogging takes so much effort! I had a similar experience over New Year’s. I found myself sick, primarily sinus, which means I dealt with a week-long headache. Having a headache meant I couldn’t really focus on writing (or reading for that matter). So in between watching several movies (which led to realizations that I will blog about soon), I kept thinking about the novel I’m currently bashing out, called RAGE. I had the basic shape of the novel, but needed to beef up motivations and overall characters. I found myself starting to think about the issues, but always falling away as I blew my nose or something. But surprisingly, when I finally got healthier and could get back to the writing, I decided to try and put some notes down so I could work out those problems I’d been trying to deal with all through the sickness…only to find I had all the answers. I’d obviously been plugging away at it subconsciously, and working out solutions. So, by the time I was ready to write, the solutions were ready to reveal themselves. Now, I’m not saying to go off and get sick for a week, but I am saying, trust your subconscious…it’ll work things out if you let it.